Sun Hing Foods: Fortune Clear Chicken Broth 42 oz. 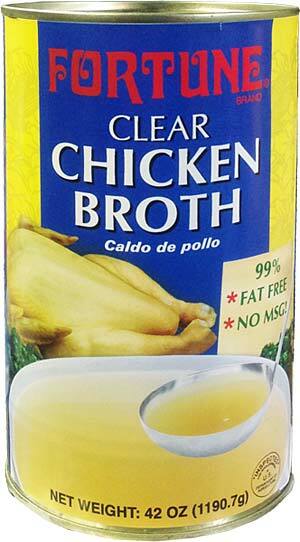 Fortune Clear Chicken Broth 42 oz. No preservatives, no artificial flavors, no artificial colors, nor MSG. Fortune Clear Chicken Broth is made only from fresh chicken and cooked slowly to a highly nutritious and flavorful concentrate. The natural and low calorie broth is the choice for those with an active lifestyle.